Fairy lights, banana leaves, chunky knit blankets, succulents, neon signs, letter boards—many of the latest decor trends can add a feeling of whimsy or nostalgia to our homes. It's difficult to choose, but letter boards might just be one of our favorite crazes. They're easily customizable, have a vintage appeal that we love, and the possibilities are literally endless. We know that nailing the perfect letter board quote for your decor (and your Instagram) can be challenging. 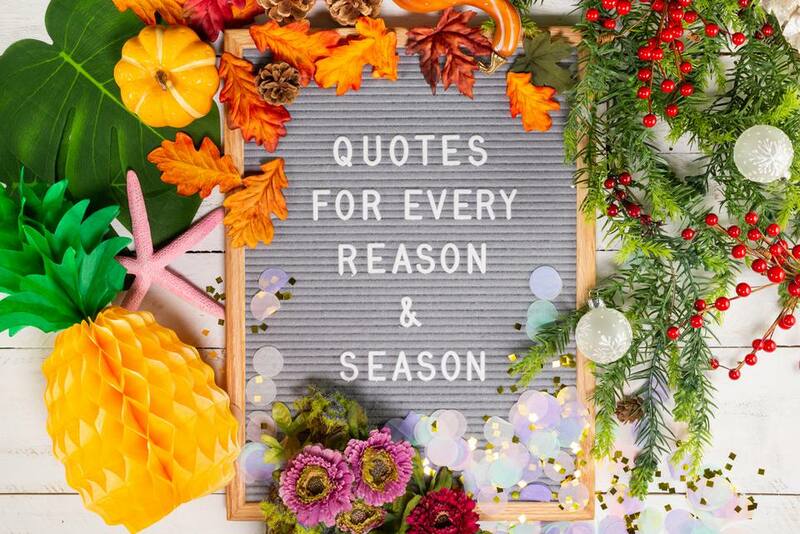 We're bad at making decisions, too—but we bit the bullet and narrowed down to our favorite letter board quotes to fit every season and mood, so you don't have to. Can we get a Y-A-S? Continue to 2 of 29 below. Once the sequins and glitter settle after New Years, nothing's left but bitter cold (unless you're lucky enough to live in a warm climate!) and forgotten resolutions (well, for most of us anyway). We promise you'll get through this—spring will be here sooner than we know it! Until then, occupy your time with new-but-easy recipes, relaxing pastimes, and productive planning. If you must give into the full hibernation mode, at least include some snuggle time with your best friend. Continue to 3 of 29 below. Whether your thumb is green or stubbornly brown, we promise you can grow a succulent! With a lot of love, and not a lot of water, beginner gardeners and dedicated plant parents will find succulents to be a joyful addition to their homes. To get started, choose from some of the most popular varieties, or be more adventurous with these unusual plants! Continue to 4 of 29 below. Just like opening a new book, a new year brings feelings of excitement of what's to come. This year, be the author of your own story when you take steps to make your best home yet, one day (or page) at a time. Bring your lunch to work, clean out your drunk drawer, make room for creativity—the year is yours. If there's one thing Buddy the Elf knows, it's how to bring whimsy and fun to what can be an otherwise stressful season. Leave all that stress at the door, grab your skates, and spread holiday cheer (singing loud!) among friends and family! Tip: Leave this letter board propped up within view every time you walk in your front door, so you don't forget about all the important activities you have planned this year! Continue to 6 of 29 below. And just like that, it's December. Christmas is less than a month away and if you haven't already started, now's the time to bake cookies, buy gifts, and binge all the best Christmas movies. Ahem. May we suggest Elf? Continue to 7 of 29 below. Ahh, the perks of Black Friday from the safety and comfort of your own home. Take advantage of Cyber Monday and shop gifts for all of your friends, family, and secret santa recipients! We've got the lowdown on all the best deals. Continue to 8 of 29 below. Whether you love Mariah Carey's iconic album or you're into the straight up classics, Christmas music puts everyone in a good mood, and it's never too soon to start jamming out (although, the day after Thanksgiving is pretty universally accepted). So turn up the volume, put up your tree, bake some cookies, and get in the Christmas spirit! If there's any day of the year to ditch diets and eat like you have the appetite of a growing adolescent boy, it's Thanksgiving. Fill up on turkey and don't skimp on any of the sides (they're arguably the best part!). Once you've cleared your plate of your second piece of pie, you've probably hit food coma status. This is where stretchy waistbands shine, so you can nap peacefully and do it all again tomorrow with leftovers! Continue to 10 of 29 below. When you were little, being secluded to the kid's table might have felt unfair, but now that you're all grown up, you've realized the adult's table isn't what it's all cracked up to be (raise your hand if you've ever been personally victimized by talk of politics around the holidays). What's the appropriate cut off for sitting at the kid's table? What if we want to color and talk cartoons and eat chicken nuggets forever? Some of us don't grow out of our picky eater habits, you know. Continue to 11 of 29 below. There's nothing better than a nice juicy bird for Thanksgiving (well, except maybe the mashed potatoes, the gravy, the pie... but we digress). And while everyone agrees dry turkey is no good, that's no excuse to bring the word moist into the discussion! shudder. Here are some amazing turkey brine recipes to guarantee a juicy main on Thanksgiving day. Continue to 12 of 29 below. Once Halloween's over, the rest of the year always seems to pass by in a haze of wine, turkey, holiday lights, and confetti. Maybe it's the shorter days, or the constant food (and wine) comas we end up in, but even so, there are plenty of reasons to celebrate in November and December, making this time of year fun (and fast!). We're looking at you, leftover Halloween candy. Okay, so maybe we were a little too overzealous about the pumpkin spice lattes this year, but with Thanksgiving on the horizon, it's too late to slow down now! Just embrace the (oversized) sweater weather and wear high-rise jeans for the rest of the season (because let's be honest, we're not skipping out on any gravy this year) and remember that the cutest animals are the roly poly ones! Continue to 14 of 29 below. Hold the tricks, pass the treats. Thanks to Parks & Recreation, National Treat Yo Self Day is October 13th every year. But long before this iconic episode aired in 2011, Halloween has served as a holiday where it's okay to really treat yourself. Whether you sneak Reese's Peanut Butter Cups and Kit Kats from your kids' candy bags while they sleep or your workplace makes it hard to resist with candy bowls on every table—don't hold back! Remember, Halloween only happens once a year. Continue to 15 of 29 below. If you're not a fan of chills, thrills, and scares, that doesn't mean you have to skip out on Halloween fun. Let's not forget the true spirit (not the ghost kind) of the holiday here—treats! Whether your treat of choice is a candy apple or a warm mug of spiked apple cider, we're here for it! Cheers, friend. Continue to 16 of 29 below. Whether or not you think Uggs are trendy or—true to their name—ugly, there's no denying the pure coziness of these shoes—it's like a warm hug for your feet that doesn't let go. The second the temperatures dip to below 50 degrees F, we're digging through our closets looking for our favorite pair (Because, yes, we definitely own more than one). What's more quintessential to childhood fall activities than jumping gleefully into a freshly raked pile of leaves? When you're the one holding the rake, you might think you'd be less tempted, but truth of the matter is that you're never too old to make the jump. This letter board will remind you to never let adulting scare you into losing your sense of childlike wonder. Continue to 18 of 29 below. Hocus Pocus! Year after year, this movie retains its position as probably the most iconic Halloween movie of our generation next to A Nightmare Before Christmas. So go ahead, pop that popcorn and brew a cup of witches brew (A.K.A. hot tea or cocoa) before hitting play—just maybe hold off on lighting any candles until sunrise. Continue to 19 of 29 below. The True Meaning of "Lit"
Pumpkin to fall is like Netflix to Friday nights. But seriously, it's getting colder and as much as we love a good happy hour, it's cozy season—candles, blankets (preferably the chunky knit kind), and a snuggly pet on our laps is exactly what the doctor ordered—paging Dr. McDreamy. Continue to 20 of 29 below. Let's be real: we all like to poke fun at the PSL, pinholing it as "basic," but unless you truly don't like the taste of pumpkin, you probably have indulged in this sugary drink at least once in your life and liked it! But even with something this good, there's always room for improvement. Go ahead, pour a little Bailey's into your next latte—we won't tell. For the love of all things ooey-gooey and chocolatey, just give us s'more days off after Sunday! One more, really, is all we need—we're not greedy. We beg you, universe. Continue to 22 of 29 below. People pleasers, beware—you can't make everyone happy. But you know what can? Avocados. (Also ice cream and pizza, probably, but with all those dairy and gluten allergies out there, you can't be too careful). Even though avocados are being unfairly blamed for the housing crisis, we still think they are the ultimate superfood: They taste super good, they make people super happy, and they make a super great costume for your cat—Avocato (ba-dum tss). Continue to 23 of 29 below. Is This What Adulting Looks Like? Adulting (v): waking up early, going to bed early, drinking lots of coffee, making macaroni & cheese outside of the box. Our true "clubbing" days may be over (or did they even start?) but we're more than happy to graduate to this kind of clubbing—the kind with three slices of bread and a frilly toothpick. Continue to 24 of 29 below. Sunday scaries, meet August anxieties. Fall might be one of the more anticipated seasons of the year, but that doesn't mean we want summer to end. Like, ever. The only thing that gets us through Monday morning is veins pumping full of caffeine. In fact, we've likely had at least 3 cups of coffee by the time 5:00pm rolls around—and hopefully that's sooner rather than later (checks watch). Want to make your next Monday that much easier? Check out these great ways to improve your morning cup o' joe. Continue to 26 of 29 below. We've got the DIY bug bad, and if you're like us, you're always looking for easy ways to DIY around the home or discover a new craft project to try. Continue to 27 of 29 below. Staying healthy is important, but diets aren't always the appropriate route. In fact, we prefer to eat what makes us happy and take care of ourselves at the same time! Who doesn't love to eat? And trying fun, new recipes is like a tasty adventure for the soul. Stuck in a dinner rut? We recommend experimenting with your instant pot or discovering all the delicious ways you can use avocados. Continue to 28 of 29 below. Even if you're superstitious, we think you'll agree that any Friday is better than a Monday. Don't worry, there are lots of ways to attract good luck if you're really worried, so you can still leave your house. Still nervous? Distract yourself with a new project or counter your phobia by checking out these cute white cats and embrace that Fri-yay spirit! Ahh, the smell of salt in the air, and the feel of wind in our hair and sand in our toes—there's nothing like it. If we could spend every weekend at the beach this summer, we'd consider that paradise. But if you aren't quite so lucky to be able to do so, recreate that feeling in your own home.